President Bush announced the fiscal year 2008 budget request to Congress Monday. NSF's budget fared better than most, calling for a 6.8 percent increase to $6.4 billion. Image is courtesy of NSF. On Feb. 5, President Bush rolled out his fiscal year 2008 budget request for the federal government. The request arrives at a time of uncertainty for federal agencies, which are currently operating on a continuing resolution and thus flat budgets rolled over from 2006 levels (see Geotimes online, Web Extra, Jan. 23, 2007), and amid billions more requested for the Iraq war, according to a Feb. 5 Associated Press story. Regardless of the president's request, however, funding the agencies and programs is ultimately up to Congress. Here's a look at where and how the budget for geoscience programs will shift under the new request, and what some of the agencies' leaders have to say about those changes. The president's fiscal year 2008 budget calls for $975 million for U.S. Geological Survey (USGS). This number includes $16.3 million for program increases, $24 million in fixed costs and $10 million in cuts. "We did average to slightly below average relative to other departments," said Mark Myers, USGS director, at a budget press conference Feb. 5. 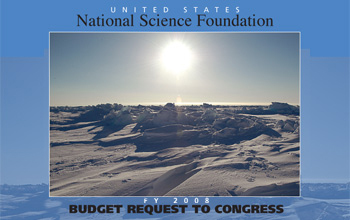 Priorities for the 2008 budget included maintaining key infrastructure components, such as streamgages, and adding new programs that relate to active and immediately relevant science, such as monitoring land use changes.  The USGS will receive $5 million from the Department of the Interior's Healthy Lands Initiative to monitor changes in habitats and landscapes, due to urbanization, and to build a geospatial framework to share information.  USGS would receive $3 million of the total $80 million designated for ocean science and research to support progress toward fulfilling the goals of the Ocean Action Plan, announced in 2004. Half would go to the Coastal and Marine Geology program for work on coastal ecosystem responses to extreme events, such as hurricanes and landslides. The other half would go to the Hydrologic Networks and Analysis program for water-quality and ecosystem monitoring.  As a means to maintain basic data collection infrastructure, streamflow monitoring would see a $1.7 million increase over the 2007 budget request.  Landsat 5 and 7, satellites that monitor changes on Earth, would still be funded in 2008, although their funding would decrease to provide money to launch the priority Landsat 8, which would receive $24 million.  The Minerals Resources Program was cut by $22 million in the 2007 request (see Geotimes, April 2006), cuts that would be carried over into the 2008 budget. The House recently passed a continuing resolution to restore this funding, although a decision has not yet been made by the Senate. NASA's fiscal year 2008 budget request calls for a 3.1 percent increase, for a total of $17.3 billion. NASA does not plan any strategic changes in its 2008 budget, and will continue to work toward transitioning from the space shuttle to the crew exploration vehicle (CEV), according to NASA's 2008 budget request summary (see Geotimes, July 2006). Also planned for fiscal year 2008 are the launches of 10 new missions, and the continued operation of the more than 50 operating missions that span the earth and planetary sciences, solar physics and astrophysics. Still, concern remains over NASA's unresolved budget appropriation for 2007, as the House moved to cut $545 million from the fiscal year 2007 request. "The fiscal year 2007 appropriation, if enacted as the House has resolved, will jeopardize our ability to transition safely and efficiently from the shuttle to the Orion Crew Exploration Vehicle and Ares I Crew Launch Vehicle," said NASA's administrator Michael Griffin Feb. 5 in a NASA briefing. "It will have serious effects on many people, projects and programs this year, and for the longer term."  $1.5 billion was requested for earth science, a 2.2 percent increase over the request for fiscal year 2007. 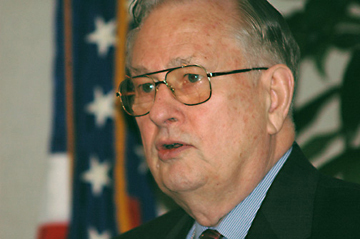 Some of NASA's 2008 budget will be allotted toward meeting the earth science priorities suggested in the National Academy of Sciences' decadal survey. This will include the new Global Precipitation Measurement mission  a satellite scheduled for launch in 2013 following the Tropical Rainfall Measuring Mission.  $1 billion was requested for solar physics, a 2.8 percent increase over the request for fiscal year 2007. New solar missions are planned for launch in 2008 to study various space weather events, such as solar flares.  $1.4 billion was requested for planetary science, a 1.1 percent decrease over the request for fiscal year 2007. The budget for planetary science would, however, include a new, small allocation for lunar research. National Science Foundation director Arden Bement Jr., discussed on Monday the highlights of the agency's fiscal year 2008 budget request. Image is courtesy of Peter West, NSF. As a whole, the president requested $6.4 billion for the National Science Foundation (NSF) for fiscal year 2008, a 6.8 percent increase over the fiscal year 2007 request. Within that budget, NSF's Directorate of the Geosciences (GEO) saw slightly less of an increase at 6.2 percent, for a total of $792 million. The numbers are particularly relevant to academic institutions, as 61 percent of total federal funding for basic research in the geosciences comes from GEO.  $240.8 million was requested for atmospheric sciences, a 6.2 percent increase over the request for fiscal year 2007. Changes from fiscal year 2007 include increases to funding for research on natural hazards, research and education grants, and investments in cyberinfrastructure. Facilities such as the National Center for Atmospheric Research also saw slight increases.  $163.3 million was requested for earth sciences, a 7.2 percent increase over the request for fiscal year 2007. Some changes include a $10 million (86 percent) increase for the EarthScope operations, which NSF listed as a priority, as operations get under way. Funding for the Incorporated Research Institutions for Seismology, a group of universities that maintain data used for hazard research, however, was cut, with funding dropping 11.6 percent to $11.4 million.  $329.3 million was requested for ocean sciences, also a 7.2 percent increase over the 2007 request. The Integrated Ocean Drilling Program saw the largest increase, up 47.3 percent to $38 million, which will go toward three drilling platforms, including the Scientific Ocean Drilling Vessel. For fiscal year 2008, Bush requested that the budget for Office of Science and Technology Policy (OSTP) increase by $5.5 billion to a total of $142.7 billion, which is a 4 percent increase over the 2007 budget. The budget "follows a similar course as the past couple of years," said Richard Russell, associate director of OSTP at the Feb. 5 briefing.  The American Competitiveness Initiative (ACI), the goal of which is to increase funding for the physical sciences, engineering, nanotech and computing, would be allotted $2.6 billion, a 7 percent increase from the 2007 request. This funding, from "an otherwise constrained budget," Russell said, would go toward funding increases for NSF, the Department of Energy's Office of Science and the National Institute of Standards and Technology core programs.  $80 million in new funding would go toward the president's new Ocean Action Plan, which funds ocean science and research at NOAA, NSF and USGS.  $309 million would go toward hydrogen energy research, as part of Bush's five-year Hydrogen Fuel Initiative that was rolled out in 2003.  $2.7 billion is requested for the Advanced Energy Initiative, a 26 percent increase over the 2007 request, which is focused on the research and development of clean energy technologies.  $863 million would go toward the Office of Fossil Energy for research into carbon sequestration technologies for coal plants, as well as the FutureGen project to look into producing electricity and hydrogen from coal.  $1.2 billion would go to the Office of Energy Efficiency and Renewable Energy, an increase of 5 percent, to expand the programs developing vehicle efficiency technology, biomass for energy, hydrogen and wind energy.  $875 million would go to the Office of Nuclear Energy, a 38 percent increase, to focus on research and development of nuclear energy technology. Geotimes staff writer Carolyn Gramling contributed to this story.